With time, many of these underfunded neighborhoods became fertile breeding grounds for socioeconomic maladjustment. More recently they have gained notoriety for their low economic value and woeful energy performance. The dream of towers in the park has ended with concrete boxes in the ghetto. Many cities worldwide must now intelligently address the legacy of these housing estates. The normative solution has been demolition, but with that comes the loss of material value, the scattering of communities, and the destruction of ecological assets. Einstein once famously said that you cannot solve problems with the same kind of thinking that created them. Over the past century, planning and architecture have focused on driving socioeconomic change using physical form. Beyond this being an intellectually questionable approach, a larger difficulty arises when the form is revealed to be inappropriate, or loses relevance over time, as has been the case with social housing typologies. How can we use the existing value in these areas as a foundation for socially, ecologically, and physically sustainable societies? More generally, how do we create urban environments that can adjust to the needs of emerging generations and changing global realities? 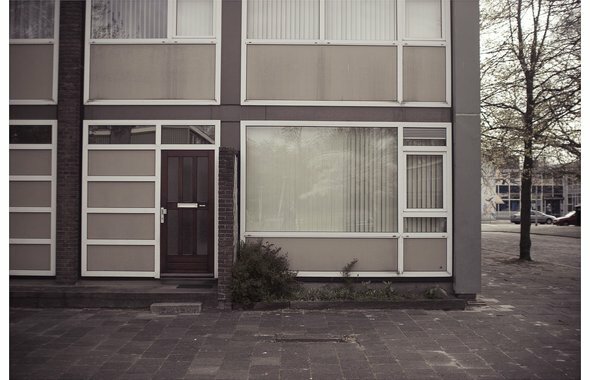 In early 2010 Vestia, one of the Netherlands’ largest social housing corporations, wanted to address one of its own problematic social housing developments. The company wanted a unique strategy for re-imagining the neighborhood that could serve as an example for similar projects. It approached the Dutch-American firm, Except Integrated Sustainability, to take this on. Staffed with professionals representing over twenty disciplines, Except is an interdisciplinary firm that develops innovative solutions for moving towards a sustainable society. Jointly headed by Tom Bosschaert (MArch ’08) and Eva Gladek (MEM ’09), it has developed pioneering projects in fields as diverse as the built environment, agriculture, business, policy, and industry. The area in question, Schiebroek-Zuid, is in the northern part of Rotterdam. Nestled in an affluent zone of private homes, it stands out as the neighborhood with the poorest performance indicators. Local retail was driven away by the threat of impeding demolition. The program is dominated by a single housing typology interspersed with a scattering of elderly homes, sports facilities, and schools. As is now the case for such neighborhoods in many cities, few funds are available for anything more substantive than general maintenance. Except’s core approach to Schiebroek-Zuid was to focus on flexibility and adaptation, and set performance-based goals rather than defining physical structure. Using the Symbiosis in Development (SiD) methodology, we developed an adaptable plan to be deployed in the neighborhood over the next twenty years. SiD provides a structured approach for designing resilient, systemic, sustainable solutions. With a team of more than twenty people, including environmental engineering by Patrick Bellew, of Atelier Ten, Except focused on improving the basic social and economic qualities of the neighborhood. As a starting point, the values and opportunities of the Schiebroek-Zuid were carefully mapped, involving the neighborhood’s community throughout the process, and used as drivers for the changes necessary to convert the area. Demolition was considered a last resort and was avoided entirely. The team also analyzed the sustainable physical carrying capacity of the area. By subsequently connecting all the energy and material flows with a wide variety of off-the-shelf technological (and biological) solutions, we showed that a self-sufficient Schiebroek-Zuid could be a reality. 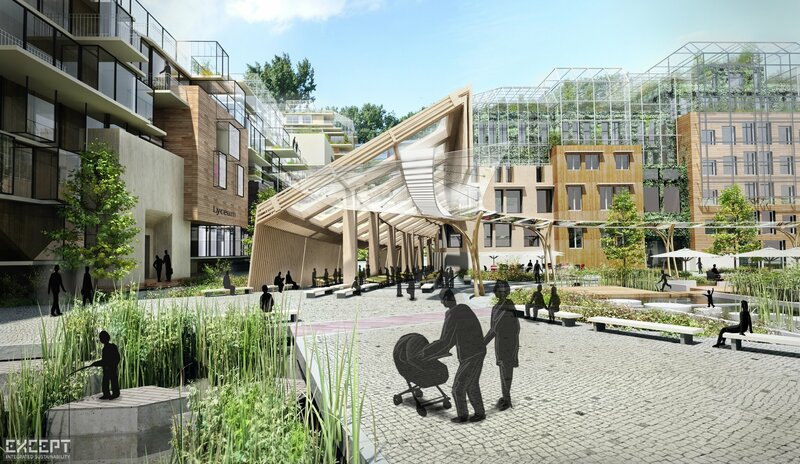 With urban agricultural systems acting as a “green metabolic engine,” the neighborhood could autonomously provide for all of its own energy, water, and waste processing needs and around seventy percent of local food demand using existing technologies. Each recommended concept would provide multiple benefits for the neighborhood. For example, greenhouses used to retrofit buildings can generate energy, collect water, and produce food. Among their most important functions, however, is the opportunity greenhouses provide for additional indoor programs such as day-care facilities or recreational gardening spaces for the elderly. All of the performance goals for the neighborhood – ranging from carbon neutrality to support for local entrepreneurs – were documented in a comprehensive neighborhood vision and phasing plan. The strength of these goals is supported by the extensive “ingredient book,” which provides a palette of solutions, both technological and policy oriented, to achieve these goals. With these two manuals, Vestia can adopt new solutions as they become available and affordable in the future, while maintaining a comprehensive vision and strategy. Both books were released under Open Source licenses in order to inspire similar neighborhoods. 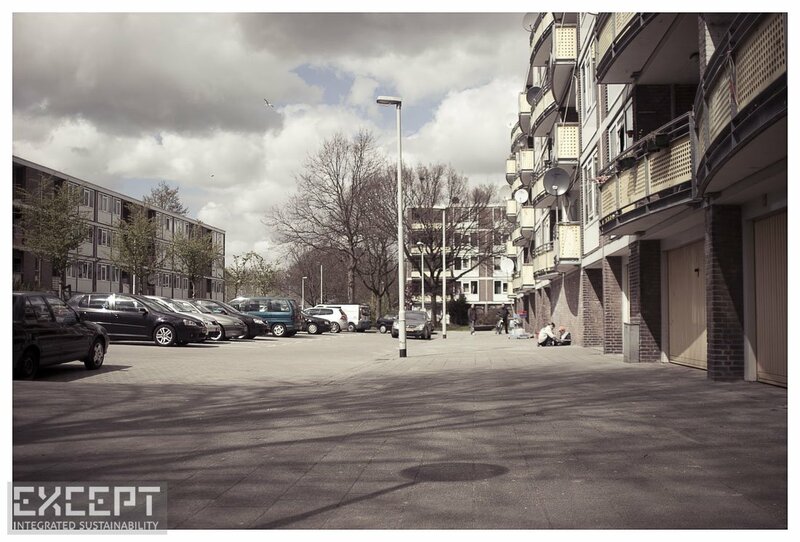 We see Schiebroek-Zuid as an example of a new approach to managing the urban environment: one that is driven by flexible process rather than predefined physical outcomes. We hope that the challenges of our era will inspire a diversity of strategies that embrace the true dynamism and complexity of our world, and explore how to harness the intelligence of evolutionary processes for shaping the built environment.